Did you know the St. Croix River is a national park? Become a Junior Park Ranger as you explore the Art Bench Trail by doing fun art & nature activities. 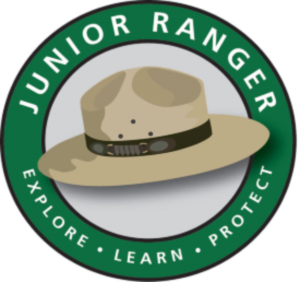 Earn your very own Junior Ranger badge. Complete four or more activities and e-mail your name, age, and mailing address to SACN_info@nps.gov. This activity can be done at any of the art benches. Bring a pencil or pen. This activity can be done at any of the art benches. Bring a pencil and crayons or colored pencils or markers. This activity can be done at any of the art benches. Bring paper, a pencil and crayons or colored pencils or markers. This activity can be done at any of the art benches. Bring paper and crayons or colored pencils. To complete this activity, visit the benches in Prescott, St. Croix Falls, Bayport, Hudson, and at Carpenter Nature Center. Bring a pencil or pen. This activity can be done at any of the art benches. This activity can be done at any of the art benches. You will need at least 6 people. Bring a ball of yarn, index cards, and a pencil or pen. To complete this activity, visit the benches in Bayport, St. Croix Falls, Osceola, and Somerset. Bring a pencil or pen. The Junior Ranger Art Bench Trail program is presented by The Phipps Center for the Arts in partnership with the National Park Service. Tell us about your experience with the Art Bench Trail and take a 5-10 minute survey.